Background: Mangrove plants have high potential in medical research and they have been used in traditional medicine for any diseases. Squalene, a natural 30-carbon triterpenoid compound, was originally obtained from Shark and for the first time isolated from mangrove plant species. From the historical background, it was known that squalene display protective actions against several diseases and carcinogens. Objective: Herein, we desire to report the in vitro evaluation of squalene on AGS cell line. In the present investigation, after 24 h incubation, the inhibitory effect of squalene was found to have significant activity on AGS cell lines proliferation. 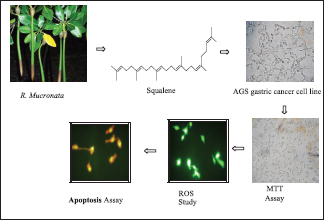 Materials and Methods: Mangrove plant isolated squalene compound was treated with gastric adenocarcinoma cancer cell line AGS for 24 h with control. The cells were treated at varying concentration range 10, 30, and 50 μg/mL. The cytotoxicity effect of squalene was studied by 3-(4,5-dimethyl-2-thiazolyl)-2,5-diphenyl-tetrazolium bromide, mitochondria membrane potential, etc., Results: Among the tested concentrations, squalene at 50 μg/mL showed a higher level of mitochondrial depolarization, DNA fragmentation, and induced apoptosis in AGS cells when compared to control. A similar but lower activity was observed in minimum doses of 20 and 30 μg/mL compared to maximum dose of 50 μg/mL. A 50% and 100% cell viability was observed at 30 and 50 μg/mL, respectively. Likewise, there was a significant reduction in thiobarbituric acid reactive substrate and lipid hydroperoxides levels, while antioxidant enzymes like superoxide dismutase. Catalase, glutathione (GSH) peroxidase, reduced GSH, Vitamin-C (Vit-C), and Vitamin-E were increased on squalene treatment in a dose-dependent manner. Conclusion: On the basis of results, it was concluded that isolated compound (squalene) from Rhizophora mucronata had a potent antigastric carcinogenic effect at 50 μg/mL in AGS cell lines and appeared to be more sensitive toward the AGS cell line. Abbreviations used: PBS: Phosphate-buffered saline; FBS: Fetal bovine serum; DMEM: Dulbecco's modified eagle medium; MTT: 3-(4, 5-dimethyl-2-thiazolyl)-2, 5-diphenyl-tetrazolium bromide; DCFH-DH-7: Diacetyl dichlorofluorescein; Rh 123: Rhodamine 123; EB: Ethidium bromide; AO: Acridine orange; TBA: Thiobarbituric acid; NBT: Nitro blue tetrazolium; PMS: Phenazine methosulfate; DTNB-5: 5-dithiobis 2-nitrobenzoic acid; GSH: Reduced glutathione. In this study, squalene prevents gastric cancer through 3-(4, 5-dimethyl-2-thiazolyl)-2, 5-diphenyl-tetrazolium bromide assay, apoptotic morphological change, mitochondria membrane potential, reactive oxygen species level, HOECHST staining assay, comet assay, and enzymatic and nonenzymatic antioxidant assays. The present study showed squalene has very well antigastric cancer property. Rhizophora mucronata (Rhizophoraceae) generally known as an Asiatic mangrove, broadly distributed along the tropical and subtropical coastal regions. This mangrove plant has been stated to possess several medicinal properties and it has been used in traditional medicine for treatment of diarrhea, dysentery, blood in urine, fever, angina, diabetes, hematuria, and hemorrhage at Burma, India, and China. Indo-Chinese system used R. mucronata roots for the treatment of angina and hemorrhage. Burmese used the bark for treatment of bloody urine. Chinese and Japanese used to treat diarrhea. Traditionally, the plant bark has been used to treat haematuria, diabetes, diarrhea, and inflammation., In addition, R. mucronata helps to conserve marine life and balances the ecosystem. The polysaccharides of R. mucronata have been reported for anti-HIV activity. From the literature, it is known that the mangrove plant R. mucronata possess significant biological activity. During the past few years, squalene was found to have protective action against several induced cancers in mice as reported by various researchers like., Based on this information, the present study was evaluated to find out the cytotoxic activities of the squalene isolated from leaves of R. mucronata. Cell culture chemicals such as heat-inactivated fetal calf serum (FBS), minimum essential medium, glutamine, penicillin-streptomycin, 3-(4, 5-dimethyl-2-thiazolyl)-2, 5-diphenyl-tetrazolium bromide (MTT), 2-7-diacetyl dichlorofluorescein (DCFH-DH), rhodamine 123 (Rh 123), ethidium bromide (EtBr), acridine orange (AO), thiobarbituric acid (TBA), nitro blue tetrazolium (NBT), Phenazinemethosulfate (PMS), and 5, 5-dithiobis 2-nitrobenzoic acid (DTNB) were used. Trypsin, phosphate-buffered saline (PBS), reduced glutathione (GSH), low melting agarose, and normal melting agarose were purchased from Sigma Chemical Co., St. Louis, USA. The air-dried leaves of R. mucronata (1 kg) were extracted using Soxhlet apparatus with 500–800 mL of three different solvents (ethanol, methanol, and chloroform) for 24 h. The crude extracts were concentrated by rotary evaporator and stored in the refrigerator for future use. Among the fractions, ethyl acetate-n-hexane fraction showed more antioxidant property compared to other and hence used for further analysis. Thin-layer chromatography was carried out to check the presence of active compounds in ethyl acetate-n-hexane fraction using ethyl acetate and n-hexane as a solvent at different ratio (8:2). Once the desired fractions (squalene fraction) were identified, the solvent was removed by rotary evaporation and the compounds were isolated. The squalene compound was conformed through GC-MS and C NMR studies. AGS gastric cancer cell line was purchased from NCCS, Pune, and maintained in Dulbecco's modified eagles medium (DMEM) at 37°C and supplementation of 2 mM l-glutamine and Balanced Salt Solution (BSS) adjusted to contain 1.5 g/L Na2 CO3, 0.1 mM nonessential amino acids, 1 mM sodium pyruvate, 2 mM l-glutamine, 1.5 g/L glucose, 10 mM HEPES, and 10% fetal bovine serum (GIBCO, USA). Antibiotics penicillin and streptomycin (100 IU/100 g), respectively, were added to the medium and adjusted to 1 mL/L. The cells were maintained at 37°C and incubated for 48 h with 5% humidified CO2. Cell viability was analyzed by 3-(4,5-dimethylthiazol-2-yl)-2,5-diphenyltetrazolium bromide (MTT) assay, as described by. Briefly, exponentially growing cells (1 × 105 cells/per well) were seeded in 96-well plates and were treated with different concentrations of isolated squalene in the series 1, 5, 10, 15, 20, 25, 30, 35, 40, 45, and 50 μg/mL for 24 and 48 h with free complete medium. 100 μL of MTT solution prepared in deionized water (5 mg/mL) was added to each 24 and 48 h-treated wells. AGS cells were allowed to incubate at 37°C for 4 h. Once incubation completed, the medium was aspirated and 200 μL of dimethyl sulfoxide was added to all well to dissolve the formazan crystals. The absorbance of solution in each well was measured at 620 nm using a 96-well microplate reader (THERMO Multiskan, USA). Intracellular reactive oxygen species (ROS) was measured using a nonfluorescent probe, DCFH-DA (2',7'-Dichlorofluorescein diacetate), which penetrates into the intracellular matrix of cells, were it was cleaved by cytoplasmic esterases into 2',7'-dichlorodihydrofluorescein (H2 DCF). In the presence of ROS, peroxidases oxidize H2 DCF into fluorescent DCF. Cells were treated with different concentrations of isolated squalene from R mucronata and incubated for 24 h. Fluorescent dye DCFH-DA (100 μl) was added to the cells and incubated at 37°C for 30 min. The AGS gastric cells were washed to remove the excess dye using PBS before fluorescent measurements that were carried out with excitation and emission filters set at 485 ± 10 and 530 ± 12.5 nm, respectively (Shimadzu RF-5301 PCS spectrofluorometer, Japan). The images were taken with help of fluorescence microscopic (blue filter) (450–490 nm) (Nikon, Eclipse TS100, Japan). AO and EtBr staining technique were used to differentiate apoptotic cells from normal cells. 1 μl of a dual fluorescent staining solution containing 100 μg/mL AO and 100 μg/mL EtBr, was added to squalane-treated cells and normal cells and transferred to glass slides, covered with a coverslip. After staining, the cancer cells were washed with PBS (pH 7.2) to remove excess unbinding dye and incubated for 1 min. The morphology of apoptotic cells was examined and visualized using a fluorescence microscope (Nikon Eclipse, Inc., Japan) at ×400 with an excitation filter at 480 nm. AGS gastric cancer cells were seeded in 6 well plates (1 × 105 cells/well) and were allowed to grow for a day before exposed to different concentrations like 20, 30 and 50 μg/mL of isolated squalene. After the specific time intervals (24, 48, and 72 h), the cells were fixed in 4% paraformaldehyde, washed twice with PBS, and exposed to the Δψm specific stain Rhodamine 123 (Rh-123) (10 g/mL) for 30 min at 37°C. 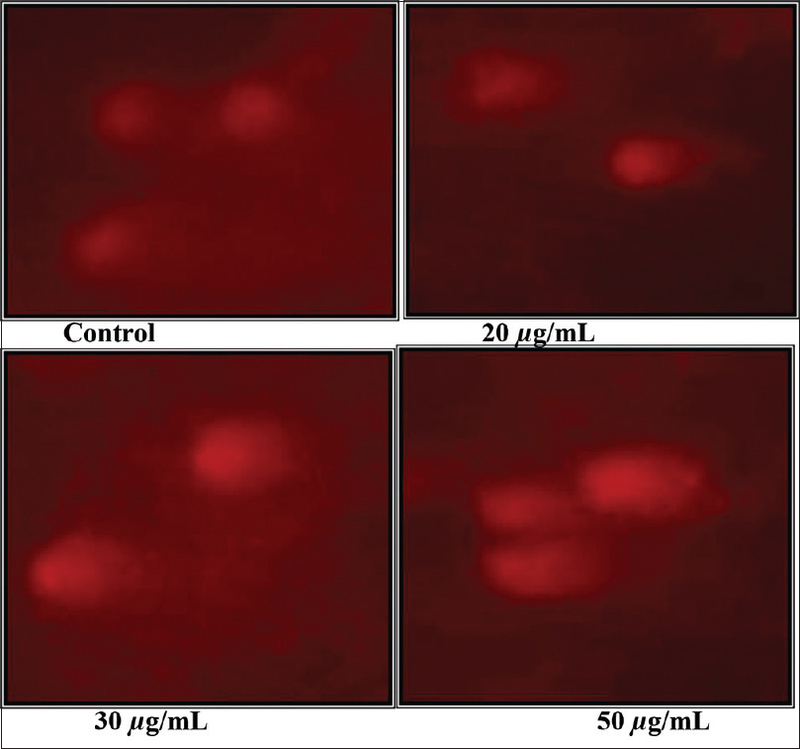 The cells were then washed twice with methanol to remove the excess stain, washed again with PBS, and analyzed for changes in Δψm using fluorescence microscope with an excitation and emission wavelengths of 505 nm and 534 nm, respectively. The chosen AGS gastric cancer cells were seeded in 6-well plates and maintained at 37°C with 5% CO2 in a humidified CO2 incubator for 48 h. Subsequently, the cells were treated with different concentrations of squalene (20, 30, and 50 μg/mL) at various incubation periods (24, 48, and 72 h). The medium was removed and the cells were washed with PBS at twice fixed with formaldehyde at 20 min and stained with HOECHST 33342 (10 g/mL) for 20 min at 37°C in the dark. Finally, stains were washed using methanol and PBS, the plate was immediately observed in fluorescent microscopy (Nikon Eclipse, Inc., Japan). DNA damaged by apoptosis was evaluated by genomic DNA fragmentation. 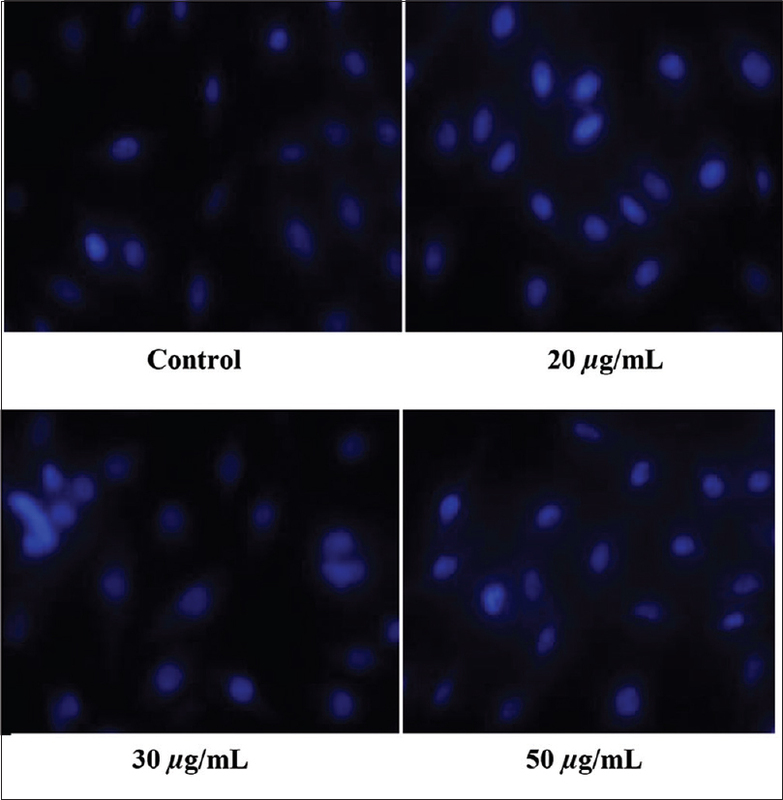 Treated cells (1 × 106 cells) at the concentrations of 20, 30, and 50 μg/mL were separately suspended in 10 mL of buffer containing 10 mM Tris–HCl and 10 mM EDTA (pH 8.0) and 20 mg/mL proteinase K. The mixture was then incubated at 37°C for 3 h, followed by DNA extraction with phenol: chloroform: isoamyl alcohol solution (25:24:1). The extracted DNA was treated with DNase free RNase at a concentration of 20 mg/mL at 4°C for 45 min and precipitated with 100 mL of 2.5 M sodium acetate and 3 volumes of ethanol. About 10 g of DNA extracted from cancer cells incubated for 45 min at 100 V on a 2% agarose gel containing EtBr and visualized under Gel Doc System (Alpha Innotech Image Viewer, version 6.0.0, Japan) was carried out using electrophoresis. The trypsinized cells were resuspended in PBS and used for the measurement of lipid peroxidative markers. Thiobarbituric acid reactive substances (TBARS) and lipid hydroperoxide (LHP) were measured according to the procedures described by. The trypsinized cells were centrifuged and the clear upper supernatant fluid was used to measure the level of antioxidant enzymes such as superoxide dismutase (SOD), catalase (CAT), and GSH peroxidase (GPx), according to the procedures described by. The supernatant obtained from trypsinized cells was used to determine the levels of reduced GSH according to the procedures described by. The data were analyzed using one-way ANOVA followed by Duncan's multiple range test (DMRT) with P < 0.05 as the level of significance. All values were presented as mean ± standard deviation. [Figure 1]a and [Figure 1]b shows the percentage of cell death both in control and squalene-treated cells. From the result, squalene at 5 μg/mL did not show any significant (P < 0.05) proliferation inhibition on AGS cell line. Among the different doses of squalene, 10, 20, 30, and 50 μg/mL, 10 μg/mL showed less significant antiproliferative activities against AGS cell line, while 30 and 50 μg/mL concentration displayed 83% and 89% inhibition on AGS cells. Hence, for further tests, the concentrations (20, 30, and 50 μg/mL) that strongly inhibited the growth of the AGS cell line were used. [Figure 2]a and [Figure 2]b depicts the fluorescent microscopic image and spectroscopic value of ROS in treated and untreated AGS cells. After 24 h, the level of ROS production in AGS cells showed significant (P < 0.05) increase at concentrations of 20, 30, and 50 μg/mL. Among the doses tested, a maximum generation of ROS in AGS cells was observed at 50 μg/mL, while the other two concentrations 20 and 30 μg/mL moderately generated ROS in AGS cells. 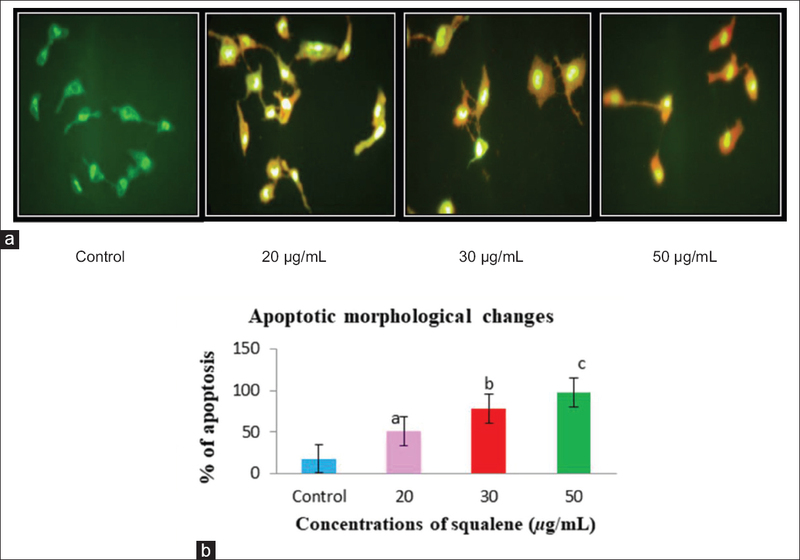 [Figure 3]a and [Figure 3]b represents the apoptotic morphological changes observed under fluorescence microscope on R. mucronata-isolated squalene-treated AGS cells compared with control cells. From the observations, it was found that the untreated cancer cells appeared green (AO stained) while squalene-treated cells appeared red/orange (EtBr stained). This result suggests the presence of cell death due to apoptosis on squalene treatment when compared to control cells. Treatment with squalene compound at 20, 30, and 50 μg/mL indicates an increased apoptotic process of 30%, 50%, and 90%, respectively, when compared to the control group. Among the concentrations, AGS cell lines after 24 h showed most sensitivity toward 50 μg/mL compared to other concentrations. 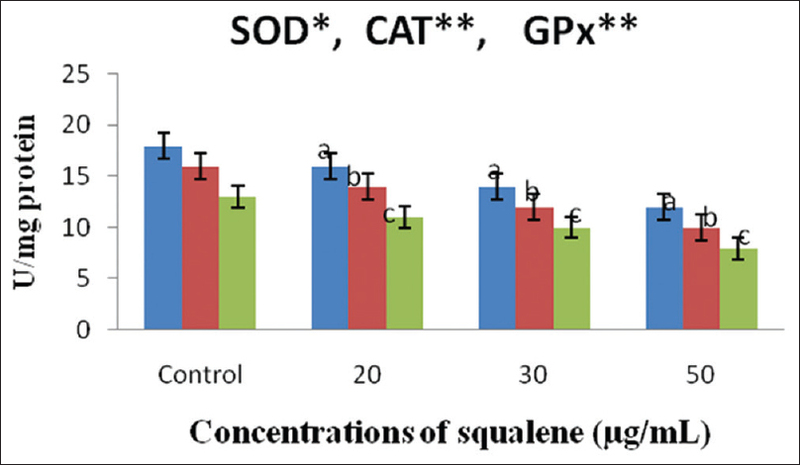 In the present result, after 24-h incubation, squalene-treated cells showed a significantly reduced mitochondrial membrane potential to 20, 30, and 50 μg/mL concentrations of squalene in AGS cells, respectively, when compared to control group. Among all the doses tested, 50 μg/mL of squalene showed the highest level of mitochondrial depolarization in AGS cells. Polarized mitochondria were marked by orange-red fluorescence and depolarized mitochondria were marked by green fluorescence. Change in mitochondrial membrane potential of control and isolated squalene-treated cells were depicted in [Figure 4]a and [Figure 4]b. The extent of nuclear DNA fragmentation after the treatment of AGS cell with R. mucronata isolated squalene at different concentrations such as 20, 30, and 50 μg/mL by agarose gel electrophoresis is shown in [Figure 5]. The result suggests that this squalene caused DNA fragmentation, a characteristic apoptotic process, results in the generation of multiple DNA fragments and induced apoptosis in AGS cancer cell at different incubation duration. Among the three tested concentrations, 50 μg/mL of squalene-treated cell observed more DNA fragmentation. Hoechst 33342 reagent form fluorescent complexes with natural double-stranded DNA and thus helps to find out the apoptotic nuclei. The squalene compound produced decreased cell viability, caused by apoptotic cell death was stained by Hoechst 33342 reagent after 24 h treatment. After staining, cells showed apoptosis on treatment of AGS cancer cell with the R. mucronata isolated squalene at their 20, 30, and 50 μg/mL concentrations of exposure for 24 h, however, control cells (untreated) indicated normal cell morphology. Apoptotic nuclei of treated cells were showed by condensed chromatin gathering, reduced nuclear size, total fragmented morphology of nuclear bodies, and at the periphery of the nuclear membrane [Figure 6]. The results clearly showed that the apoptotic nuclei were induced when the cancer cells were treated with R. mucronata-isolated squalene at 20, 30, and 50 μg/mL concentration. Among the concentration 50 μg/mL, squalene-treated cell indicated more nuclear damage, reduced nuclear size, and condensed chromatin. The isolated compound squalene was evaluated for its activity against lipid peroxide markers, such as TBARS and LHP in AGS normal and treated cells as shown in [Figure 7] and [Figure 8]. From the figure, it was known that treatment with 50 μg/mL of isolated squalene significantly increased the lipid peroxidation level in AGS cells when compared to other concentrations (20 and 30 μg/mL) and control. In addition to this, the squalene at 50 μg/mL dose showed a significantly decreased level of SOD, CAT, and GPx in AGS cells than 20 μg/mL and 30 μg/mL concentrations. The activities of enzymatic antioxidants in control and treated cancer cells are depicted in [Figure 9]. The study also showed the effect of squalene on GSH levels in AGS cancer cells. Levels of GSH in control and R. mucronata-isolated squalene cells are showed in [Figure 10]. The treatment of R. mucronata-isolated squalene (20, 30, and 50 μg/mL) decreased GSH levels in tested AGS cells. Regarding all the doses tested, 50 μg/mL of tested concentration decreased GSH levels significantly in AGS cells. Natural products derived from medicinal plants have a pronounced effect on the treatment of various diseases including cancer. The WHO estimated that among 80% of the world's population mainly those of developing countries rely on plant-derived medicines for the health care. 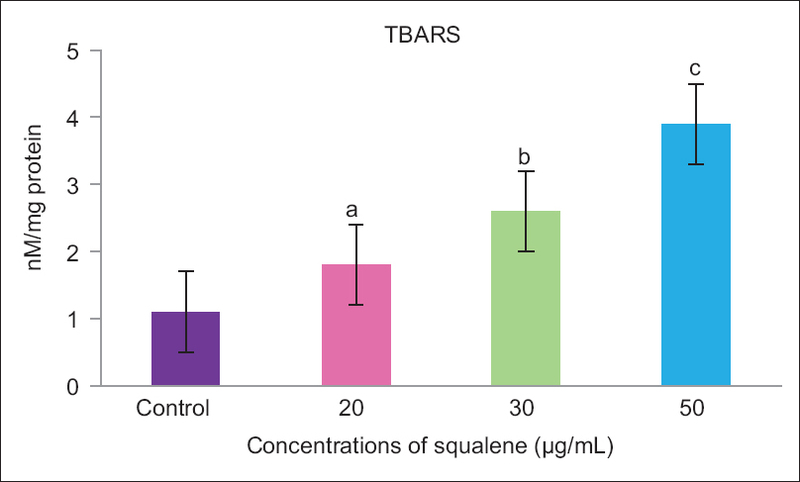 In the present study, the cytotoxicity effect of squalene in AGS cells by MTT assay was observed. 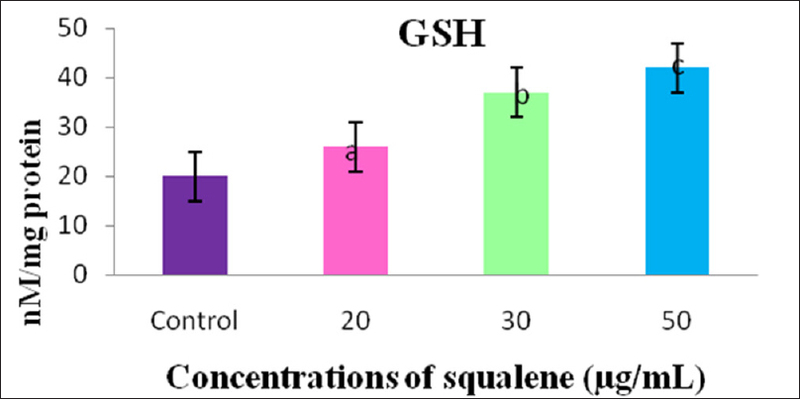 After 24 h, the higher concentrations of squalene (50 μg/mL) potentially inhibited the growth of cells when compared to squalene at lower concentrations (5, 10, and 20 μg/mL). This might be due to the pro-oxidant property of squalene at higher concentration. 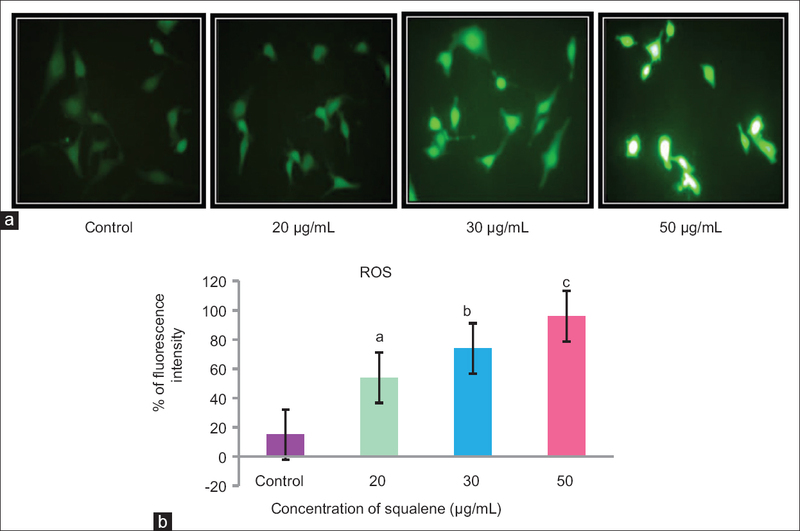 Thus, squalene exhibited a dose-dependent cytotoxic activity after 48 h.
Squalene treatment at 50 μg/mL caused a significant rapid increase in intracellular ROS level in AGS cells. The increased ROS levels during squalene treatment might be due to its pro-oxidant property. Similarly, the pro-oxidant activity of plant extract has been already confirmed by several researchers., ROS such as O2•- and H2O2 is recognized to induce SOD, CAT, and GPx. Higher activities of antioxidant enzymes have been detected in malignant tumors compared to controls. Squalene-treated cancer cells showed a decreased Rh-123 dye accumulation with a significantly increased mitochondrial depolarization in AGS cells compared with control. The present result revealed that among the tested concentrations, the highest concentration 50 μg/mL exhibited a higher level of mitochondrial depolarization in AGS cells than the other doses. Previous reports indicated that some of the mangrove-derived compounds from Acanthus ilicifolius, Bruguieras exangula, Morinda citrifolia, Terminalia catappa, and Ecteinascidia turbinata revealed to have stronger activity against a variety of carcinomas. Previous reports indicated the mangrove-derived anticancer activity of compounds isolated from mangrove species. Some of the mangrove plants such as A. ilicifolius, B. exangula, M. citrifolia, T. catappa, and E turbinata have revealed to produce compounds that strong activity against a variety of carcinomas. In this present in vitro antigastric cancer activity of AGS cell line, the isolated squalene have exhibited good result. It was found that squalene arrested the gastric cancer cells proliferation up to 90%. The induction of DNA single-strand break is often used to predict oxidative damage of tumor cells. A similar previous report has been obtained from some of the researchers are known to enhance oxidative DNA damage in cancer cells., In the present study, tumor cells reveal response to the treatment of squalene but more pronounced response was observed with higher doses of squalene. The phytochemicals have proved to induce DNA damage in cervical cancer cells by generation of reactive oxygen species. Since cancer cells have centrally acidic region squalene could not be able to act as antioxidant and most phenolics act as pro-oxidant in cancer cells. The increased DNA damage in squalene-treated cells can be due to its pro-oxidant effect. A huge number of natural compounds have been showed to have cytotoxic effects in numerous situations either alone or together with radiation. Similar to our findings some previous report confirmed that squalene induced DNA fragmentation and disintegration of cancer cell line by apoptosis process. The obtained results indicated that squalene treatment significantly improved apoptotic morphological changes in AGS cells. The microscopical observation indicated a typical morphology of apoptosis, i.e., nuclear fragmentation, chromosomal condensation, and cell pyknosis in squalene-treated cells. Apoptosis has been showed to play a significant role in determining cellular cytotoxicity. Apoptosis has been known to be a major means of cell death after cytotoxic drug treatment. The increased ROS levels and succeeding oxidative DNA damage might be the purpose for increased apoptotic morphological changes in the squalene-treated cells. ROS is implicated in the disturbance of mitochondrial membrane potential and release of cytochrome c in the cytosol which after binding of Apaf-1 forms apoptosome complex. This complex initiated the cascade by activation of caspase 9. ROS generation is also involved in p53 and in Fas-induced apoptosis. Accordingly, Kathiresan Sithranga Boopathy et al. indicated that mangrove plants extract, induced apoptosis in human cancer cells as similar to the results obtained. The results clearly indicated that the inhibition of growth was induced when the cancer cells were treated with squalene compound. In accordance with findings, the antiproliferation effect of R. mucronata-isolated squalene might be due to their potential to induce apoptosis in the AGS cancer cells. Hydroxyl radical formation and reduce ferryl myoglobin suggest their potential pro-oxidant action. A lot of studies have suggested that antioxidant enzymes are stable in protective action against tumor-promoting agents. Interestingly, cell malignancy or transformation is regularly accompanied by decreased antioxidant enzymes activities such as SOD, CAT, and GPx, which in turn increases the cell sensitivity to pro-oxidant compounds. In the present study, the observed reduced activities of antioxidant enzymes such as SOD, CAT, and GPx were found with squalene-treated cancer cells, which reported that mangrove plants and their compounds decreased the antioxidant enzymes such as SOD, CAT, and GPx in experimental models. 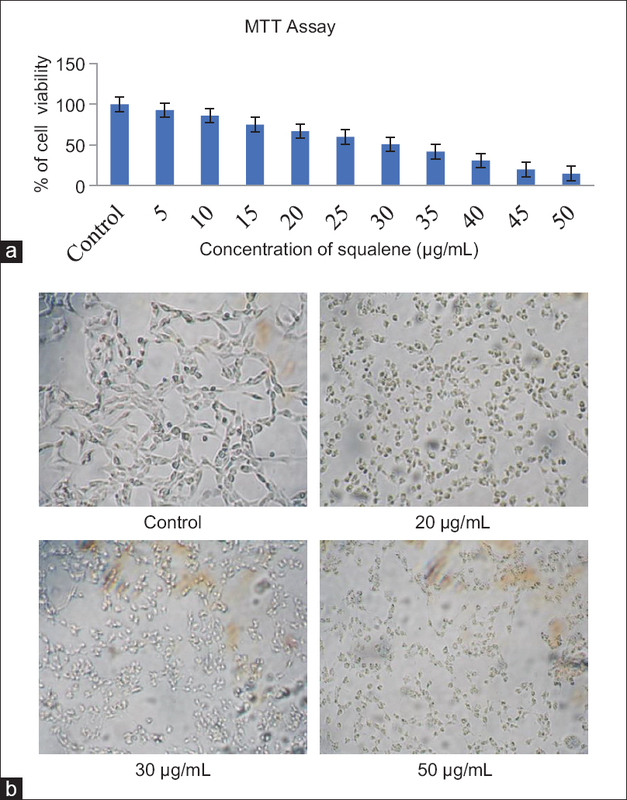 Squalene enhanced a reduced cell proliferation of AGS cell line with an increased antioxidant status, intracellular ROS and induced apoptosis mediated by DNA damage, alteration in mitochondrial membrane potential, and increased lipid peroxidation. All the results confirmed that R. mucronata-derived squalene could be considered as an effective antigastric agent. Duke JA, Wain KK. Medicinal plants of the world, Computer index with more than 85.000 entries. In: Duke JA, editor. Handbook of Medicinal Herbs. Boca Raton, Florida: CRC press; 1981. p. 3. Perry LM. Medicinal Plants of East and Southeast Asia. Cambridge: MIT Press; 1980. Bandaranayake WM. Bioactivities: Bioactive compounds and chemical constituents of mangrove plants. Wet Ecol Manage 2002;61:421-52. Das AK, Rohini R, Hema A. Evaluation of Anti-diarrhea activity of Rhizophora mucronata bark extracts. Int J Alter Med 2009;7:5. Premanathan M, Kathiresan K, Yamamoto N, Nakashima H. In vitro anti-human immunodeficiency virus activity of polysaccharide from Rhizophora mucronata Poir. Biosci Biotechnol Biochem 1999;63:1187-91. Senthil Kumar M, Sripriya R, Vijaya Raghavan H, Sehgal PK. Wound healing potential of cassia fistula on infected albino rat model. J Surg Res 2006;131:283-9. Smith TJ. Squalene: Potential chemo preventive agent. Expert Opin Investig Drugs 2000;9:1841-8. Gu L, Wu T, Wang Z. TLC bioautography-guided isolation of antioxidants from fruit of Perilla frutescens var. acuta. LWT Food Sci Technol 2009;42:131-6. Rastogi RP, Singh SP, Häder DP, Sinha RP. Detection of reactive oxygen species (ROS) by the oxidant-sensing probe 2',7'-dichlorodihydrofluorescein diacetate in the cyanobacterium Anabaena variabilis PCC 7937. Biochem Biophys Res Commun 2010;397:603-7. Siddique YH, Ara G, Afzal M. Estimation of lipid peroxidation induced by hydrogen peroxide in cultured human lymphocytes. Dose Response 2012;10:1-0. Weydert CJ, Cullen JJ. Measurement of superoxide dismutase, catalase and glutathione peroxidase in cultured cells and tissue. Nat Protoc 2010;5:51-66. Tipple TE, Rogers LK. Methods for the determination of plasma or tissue glutathione levels. Methods Mol Biol 2012;889:315-24. Mukherjee PK. GMP for Indian systems of medicine. In: Mukherjee PK, Verpoorte R, editors. GMP for Botanicals: Regulatory and Quality Issues on Phytomedicines. New Delhi: Business Horizons; 2003. p. 99-112. Oya SA, Aslihan A, Ozkan T, Karadag A, Gurleyik E, Altinokand B, et al. Antiproliferative, apoptotic and antioxidant activities of wheatgrass (Triticum aestivum L.) extract on CML (K562) cell line. Turk J Med Sci 2011;41:657-63. Kumaraguruparan R, Subapriya R, Viswanathan P, Nagini S. Tissue lipid peroxidation and antioxidant status in patients with adenocarcinoma of the breast. Clin Chim Acta 2002;325:165-70. Asaduzzaman Kha MD, Tania M, Zhang DZ, Chen HC. Antioxidant enzymes and cancer. Chin J Cancer Res 2010;22:87-92. Bandaranayake WM. Traditional medicinal uses of mangroves. Mangrove and salt marshes. Wetl Ecol Manage 1998;2:133-48. Barrera G. Oxidative stress and lipid peroxidation products in cancer progression and therapy. ISRN Oncol 2012;2012:137289. Srinivas P, Gopinath G, Banerji A, Dinakar A, Srinivas G. Plumbagin induces reactive oxygen species, which mediate apoptosis in human cervical cancer cells. Mol Carcinog 2004;40:201-11. Wang H, Khor TO, Shu L, Su Z, Fuentes F, Lee JH, et al. Plants against cancer: A review on natural phytochemicals in preventing and treating cancers and their druggability. Anticancer Agents Med Chem 2012;12:1281-305. Zaziri E, Consonni R, Tsimidou M. Squalene oxidation products: Monitoring the formation, characterisation and pro-oxidant activity. Eur J Lipid Sci Technol 2014;116:1400-11. Samarghandian S, Shabestari MM. DNA fragmentation and apoptosis induced by safranal in human prostate cancer cell line. Indian J Urol 2013;29:177-83. Vaux RG. Apoptosis in the development and treatment of cancer. Carcinogenesis 2005;26:26-270. Wang C, Youle RJ. The role of mitochondria in apoptosis*. Annu Rev Genet 2009;43:95-118. Norbury CJ, Zhivotovsk B. DNA damage-induced apoptosis. Oncogene 2004;23:2797-808. Kathiresan KA. Review of studies on Pichavaram mangrove, Southeast India. Hydrobiologia 2000;430:185-205. Sithranga Boopathy N, Kandasamy K, Subramanian M, You-Jin J. Effect of mangrove tea extract from Ceriops decandra (Griff.) Ding Hou. on salivary bacterial flora of DMBA induced hamster buccal pouch carcinoma. Indian J Microbiol 2011;51:338-44. Attoub S, Hassan AH, Vanhoecke B, Iratni R, Takahashi T, Gaben A. Inhibition of cell survival, invasion, tumor growth and histone deacetylase activity by the dietary flavonoid luteolin in human epithelioid cancer cells. Eur J Pharmacol 2011;651:18-25.